Niki Agenda is a daily/weekly calendar for children, teen-agers and adults needing visual organization of their days. Especially this helps people with communication difficulties and behavior problems to increase their levels of autonomy and participation. Niki Agenda is a valued tool for parents and therapists, and has been designed to be easily managed by the end user as well. Niki Agenda provides two modes for scheduling activities (daily or weekly), and the day is divided into three times (morning, afternoon and evening). Each activity can be easily marked with a comprehensible symbol indicating its state (completed, canceled, next) or type (preferred, timed, rewarded). The application includes a basic library of pictograms that can be completed or replaced with own pictures and photos, and is widely customizable. Niki Agenda provides also a token economy feature. 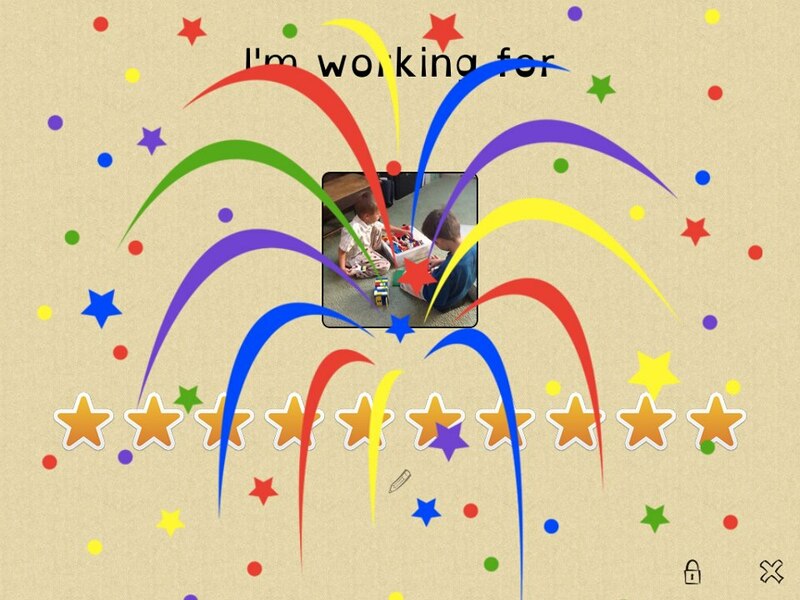 This shows the reward (a picture chosen from the library) and a set of stars to be lit, one for each completed activity. I really like this visual schedule. It is simple to use, but actually quite feature rich. I feel this app was really well thought out, and there are several features that stand out. It is actually much more than a typical visual schedule -it also has a weekly view feature and a token board as well. One of the features I love is how Niki Agenda divides up the daily schedule into three chunks of time- Morning, Afternoon, and Evening. These are natural transition points for children, and this feature makes the schedule less overwhelming- without these groupings there would be a quite a few tasks for the child to scroll through and complete for each day. These logical transition points are marked with easily recognizable icons too- In the morning when the child wakes up, he/she can tap the “Sun” symbol to view the first part of the day. Once the items for the morning have been completed, the child can tap on an icon showing the sun setting. The evening symbol shows a moon. The child can focus on tasks for that period of time only, without visual clutter from earlier in the day. To view all items in a day, the weekly view can be used- the schedule for that day stands out, while the other days of the week are automatically dimmed to take focus off of them. The first five items of the day will show, but you can use a scrolling motion to scroll through all tasks for the day. Editing within the schedule is very easy too. To edit, tap and hold the lock symbol first, then the address book symbol, to reveal the main settings. You may want to not press the lock in front of your kiddo as he/she too will have access to the settings! This hasn’t been an issue for us, but we all know how clever our kiddos can be! Adding my own pictures from the iPad’s photo album was easy, although I should note there is no option for taking a picture from within the app. My kids like the fact that they can choose their own colors (23 choices of color!) for each day of the week too- and you can decide to have the colors show up as solid or an outline. There are settings for two users that come free with the app, with the option to add more users as an in-app purchase. You can also set how you will “check off” the tasks as completed. There are 6 different options for displaying the “status” of each task, including check marks, Xs, arrows, hearts, clocks, or stars. These will show up when you tap the empty tick box to the left of each image. The check mark and X status markers will dim the task’s image when applied, the others do not. I have saved one of best features for last- the dyslexia font! The schedule allows you to easily type in each task, using one of three fonts. (Handwriting, Helvetica, and OpenDyslexic). The OpenDyslexic font has been designed specificly for dyslexics, and is a great addition to the app- I find myself using this font exclusively. Niki Agenda is a natural consequence of my first app, Niki Talk. Two years ago I was looking for a solution to allow my daughter Niki, 8 years old autistic and non verbal, to communicate effectively. In collaboration with her therapist, specialized in AAC and assistive technologies, we started to purchase and try some of the best selling applications available on the market. But after the initial enthusiasm, we realized that most of these applications were not easy to use as they should be, and some key characteristics were not present. So I created Niki Talk, an easy to use AAC application with a familiar PECS look to make the change from the book easier. Then, many enthusiastic parents and therapists asked for an agenda with the same level of usability. Niki Agenda is the result of their demands. This app was first released January, 2013. It took me 2 months. Fully involved. My favorite feature is the usability. Niki Agenda is a value tool for parents and therapists, and was designed to be easily managed by the end user as well. Certainly my favorite page is the Token Economy page. Not so much for the technical content, but just because it makes users happy. What skill were you hoping to help the end user to develop? Niki Agenda is for children, teen-agers and adults needing visual organization of their days.